It's been over three weeks since my last update on the program and quite a few things have happened. I'm back at uni with 2 weeks left and snowed under with all the work that is left to do, but as far as Disney World is concerned it's now just 35 days to go, or 5 weeks! In 5 weeks time I'll be at Gatwick Airport's Premier Inn probably unable to sleep with all the excitement! Over the past few weeks it's no longer just Yummy Jobs that have been emailing us, Disney has too. The first email we got was to pay for our medical insurance, this is done through a company called HTH Worldwide, which Disney have partnered with. The price is a shocking $70 per month and you have to pay for a whole month even if you are only there for a portion of it. That set me back $210! And that was for the cheapest package. From what I understand, this also only covers you if you have no medical problems, which is fine for myself but as this insurance is mandatory those that do have problems have to take this one out AND find an additional policy! If you're thinking of travelling you also need to have the insurance throughout your travel period. Luckily this fits within my 3 months. Once you have paid you get access to proof of insurance on the website which must be printed to take with you to the US. Disney also sent us a welcome email confirming our program dates, as well as our applicant number which will be needed later on in the process. As well us paying for our housing throughout the program, Disney requires you to pay $104.50 for a housing fee which pays for special events where they have free food, give out free stuff and the graduation ceremonies and parties, etc. I'll be having to eat a lot of free pizza if I'm going to be making my money back. I had a bit of trouble paying this, as my login didn't work but an email to Disney quickly fixed this. I got an email confirmation sent to me, which was printed in order to check-in at housing. This was an email sent out by Yummy Jobs on behalf of Disney and essentially it was a long boring document about working in the US with information we had been given before, but it seems to some sort of US government requirement so that we know how much this is going to cost us, what we're doing while we're there and our rights. Important stuff but boring. You have to email back and confirm you've read this. 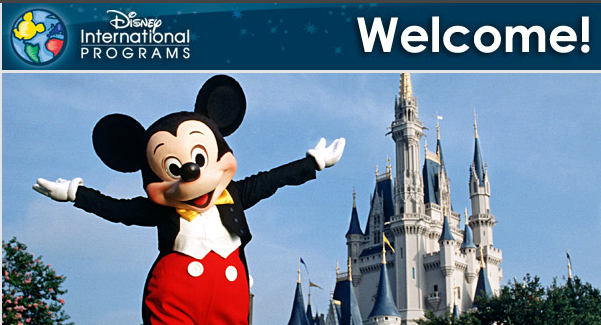 This is a Disney email which gives you your applicant ID again, and asks you to submit your program assessment fee if you haven't already. In addition, it has links to the "onboard" Disney website to read which has tips on travelling and more information about housing and roommates. One of the links is also to "hiring documentation"which are your work contracts (yes, there's several of them), so it's important that you read these thoroughly and print and sign these. It will all be needed during the check in process. Disney has announced that for the first time ever ICPs will be able to request who you want to live with, where and how many rooms. It's not guaranteed but it's a great chance to at least put down some preferences. Exciting stuff! I've also sent an email to Disney International Recruiting requesting to work on a rollercoaster as I'd really, really like to do that and learn all about how the mechanics of them work! No reply from them as of yet. I sent a similar email back in January which got no reply, but it can't hurt to ask. If someone in Disney's international recruiting department sees this, please work your magic!